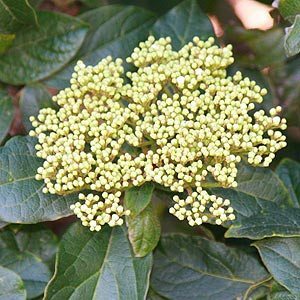 One of the most popular hedging plants, Viburnum tinus is easy to manage, has good dense growth and attractive foliage. Better suited as a smaller hedge than V. odoratissimum. With good dense bushy foliage and mid to deep green foliage Viburnum Tinus is widely used as an evergreen hedging plant. Viburnum Tinus (picture right) is sometimes commonly called the ‘Laurustinus’ tree or plant. 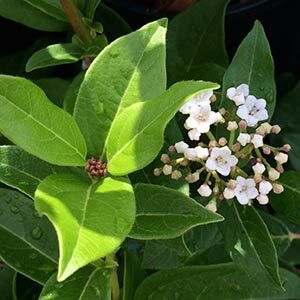 V. tinus is used both as flowering shrub or screening plant. Very popular with landscapers as it has a moderate growth rate. White flowers in summer follow the pink buds in abundance in spring. V. tinus ‘Eve Price’- A smaller rounded form with white flowers. V. tinus ‘Variegatum’ – Variegated foliage as the name suggests, not widely offered in Australia. Growing well in part shade to full sun this Viburnum also does well in coastal conditions. Reaching 3 -4 m and being frost tolerant of the viburnums, V. Tinus makes a great hedging plant and can also be used at the rear of the garden border as a background plant. Excellent as a smaller hedge to around 1.5 – 2m in height as it is slower growing than others. Smaller foliage also makes for a neater hedge after pruning. It can be grown to 3m, however seems happier if kept a little smaller. Plant Viburnum tinus at around 1m apart or at 70cm for a quicker dense hedge. Pruning can be carried out in early spring, or light pruning at any time of the year except during very cold spells.